The public, not the media, will shape Florida's April 25th debate. Normally, the press frames important US election debates by choosing the questions and controlling the video broadcast. For the first time, however, the public will decide the agenda in a clash over a contested US Senate seat. Republican David Jolly and Democrat Alan Grayson are vying for Marco Rubio's vacated Florida Senate post, and will lock horns on April 25th at 7PM eastern time in the Florida Open Debate. The public will be able to submit questions for the event, hosted by the Open Debate Coalition, starting today at 6AM until the cutoff at 12PM ET on April 25th. 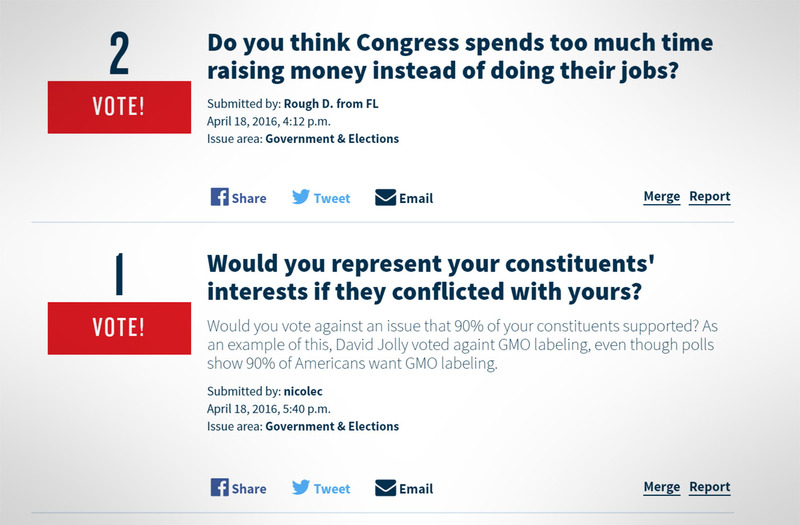 While the contested seat is in Florida, anyone can submit and vote on questions. Only Florida ballots will count, but "others can cast votes to impact which questions are trending or most seen on the site -- influencing which questions Florida voters see and vote on most," according to the Open Debate Coalition. The top 30 questions will make the cut, and a group of moderators will decide which of those to ask candidates. Moderators include The Young Turks, a top YouTube news channel, and the Independent Journal Review, a Vine channel with nearly 40 million monthly visitors. A key part of the debate is the open video feed, which allows "any website or TV station [to] broadcast the debate live or re-broadcast later without worrying about copyright." The coalition hopes the feed will open the debate up to a lot more viewers, especially cord-cutters that would never watch such an event on, say, Fox or MSNBC. The debate will no doubt revolve around local Florida issues, but it has national ramifications, since there's a tight 9-seat gap between US Senate Democrats and Republicans. In addition, some of the ideas proposed by the Open Debate Coalition may be used during the presidential debates, according to the Commission on Presidential Debates Co-Chairman, Mike McCurry. "We'd be especially interested in any experiments or new technologies the Open Debates Coalition employs during the primary season to generate questions from the American public and put them -- via a journalist/moderator -- to the candidates "
The Open Debate Commission was founded in 2008 and is backed by a diverse group including Wikipedia's Jimmy Wales, Newt Gingrich, Ariana Huffington and US representatives from both parties. The commission has already impacted US election debates, as it convinced US networks to place the 2008 presidential debate videos in the public domain and launched the first-ever open debate for a Congress seat in 2013. You can now submit questions to the Florida Open Debate for next week's debate, and if you're not sure of the issues, get some ideas from our Engadget Election Guide.